An easy assumption to make is that the men and women serving in our armed forces are American citizens. But that is not always the case. When the war broke out, and casualties started to mount, it was discovered that some who died were still waiting to become Americans. To correct what some have called an injustice, the government awarded these fallen soldiers U.S. citizenship posthumously. And lawmakers decided to speed up the process for those immigrants who fought in Operation Iraqi Freedom and lived to tell about it. Since then, many non-citizens are now proud to be able to call themselves Americans. Two such people are Airman Julio Rosales from El Salvador and Petty Officer, 3rd Class, Miguel Chavez from Ecuador. They became citizens along with about 214 soldiers during a naturalization ceremony on the U.S.S. Constellation on Wednesday. And they visited The Early Show on Friday to describe what this July 4th means to them. Chavez says since he was a little kid he dreamed of coming to America. He explains, "I always loved the United States. I read history, American history, with articles and when I was in high school, I read John F. Kennedy's biography. So that was my dream and I did everything with God's help. That's why I joined the military Navy." A U.S. resident for 11 years, Chavez says he decided to put his life in peril for this country three years ago. He says, "I was inspired by John F. Kennedy's words, 'It's not what your country can do for you, it's what you can do for the country.' Also I wanted to do something that meant something very special to demonstrate my appreciation and love for the United States of America and I'm proud of it." Pride in being an American citizen was also what motivated Rosales to join the military. "This is a great country, a land of opportunities. I always wanted to excel in life. What better way but to join the military and become a U.S. citizen, which I'm glad," he says. "I'm so happy, so excited, my first holiday as an American, it's just overwhelming. I can't express the optimism I'm feeling right now just to say 'I am an American. I'm a U.S. Citizen.' So, you know, I wanted to make my parents feel proud of me. I wanted to feel proud of myself. That's the way I am right now, proud of myself. I'm proud to be on this land. I'm proud to be an American. I'm just happy." People from more than 70 countries, including Russia, El Salvador, Ecuador and Haiti, were represented at the naturalization ceremony on Wednesday. Many immigrants joined the military in an effort to earn money towards a college education. Some enlisted to take a career out of serving their country, and others saw the military as a quicker route to becoming a U.S. citizen. Under federal law, foreigners can apply for citizenship five years after gaining residency, and until last year, immigrant soldiers could do so after three years. But last July, citing the war on terrorism, President Bush signed an executive order to eliminate the three-year waiting period and made service personnel immediately eligible for citizenship. In addition, U.S. Rep. Doc Hastings (R-Wash.) introduced a bill in April that would grant immediate citizenship to all immigrants on active duty in the armed forces, provided they meet all other legal requirements, such as speaking and writing English and passing a test on the U.S. government and history. The bill would also allow permanent residents to be sworn in as citizens the day they enlist. "The right time to give them citizenship is when they are alive and not after they have died," said Hastings. Sen. Barbara Boxer (D-Calif.) and U.S. Rep. Martin Frost (D-Texas) also have introduced legislation that would waive the $300 naturalization fee and allow citizenship interviews and swearing-in ceremonies to be conducted oversees. And U.S. Rep. Darrell Issa (R-Calif.) has introduced a bill that would allow the spouses and children of soldiers granted posthumous citizenship to also become naturalized. Currently, the award is honorary and conveys no immigration benefits to surviving family members. On June 5, 2003, the House and Senate approved legislation to speed up the process of becoming a U.S. citizen for green-card holders and to help their families if they are killed. The House approved, by a 414-5 vote, a bill that would cut the waiting period to become a citizen from three years down to one year - the time active duty members have to wait before applying for citizenship during peacetime. Of the 1.4 million service members, 37,000 active-duty members are not citizens and nearly 20 percent of them had taken advantage of President Bush's July 2002 order. 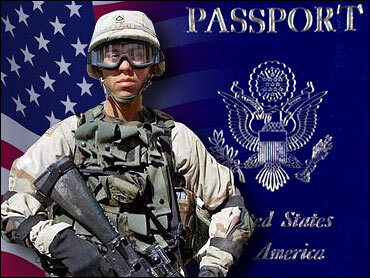 As of June 5, 2003, the Pentagon has confirmed that 12 non-citizens - 11 Marines and one GI - had died in the Iraqi war.